Khet 2.0 is quite unusual and interesting strategy game for 2 players. The game has 28 Egyptian-themed pieces and is played on 8 x 10 board. Each player has a Pharaoh that shoots an eye-safe laser to illuminate opponent’s figures and win the game. Many of the pieces have mirrors that reflect the laser light at 90 degree angle. The pieces are strategically moved by one square per turn to direct the light towards opponent’s figures and eliminate them. Players can also rotate their pieces in place to position them to reflect the laser light. Quite often, even opponent’s mirrors are used to direct the beam to the target. It is pretty simple: move or turn a piece and press the button on your Pharaoh to shoot the laser. If the light shines on a figure, that figure is out. But be careful: don’t shoot your own guys! Winner is the one first to illuminate the opponent’s Pharaoh. Two beamsplitters (sold separately) can be added to increase the game’s complexity. The beamsplitters reflect partially like a mirror but also allow light through. The game is for anyone 9 and older who likes to play games like chess and checkers. It is very engaging and requires planing just like in chess. We bought it when our son was 8 and he learnt to play it very quickly. Now he is so good at it that mom and dad don’t stand a chance. 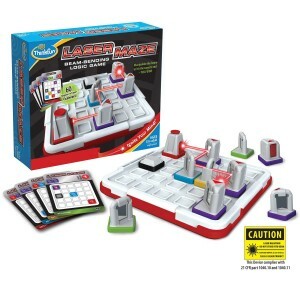 A single player Laser Maze Logic Game similar to Khet 2.0 is sold by ThinkFun and teaches the basics of light reflection used here. Qwirkle board games are cross between Scrabble and Dominoes. They are for 2 – 4 players, ages 6 and older. The original Qwirkle uses square tiles (1 3/4″ x 1 3/4″) with 6 different shapes in 6 colors. The goal is to create rows and columns of matching colors or shapes to score points. Players can learn strategies to maximize their points. 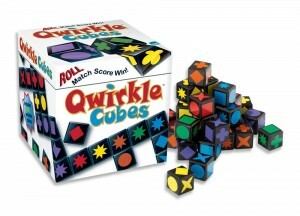 Qwirkle Cubes is very similar to Qwirkle but because each cube has 6 sides there is more control over the game. Qwirkle Travel Size has tiles which are smaller (3/4″ x 3/4″) and a travel case. This unique game by Ravensburger challenges kids to plan and think ahead. Although a single person can play it, the game is much more fun and challenging when played with others (up to 4 players). It is for kids 8 and up but is challenging enough to be enjoyed by adults as well. 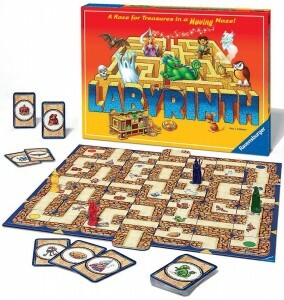 Ravensburger Labyrinth is available in a few similar variations. At the beginning of the game each player gets 7 game cards which show the treasures that the player needs to collect. To collect a treasure (i.e. keep the card) the player needs to move their figure through an existing path to that treasure on the board. The one that collects all their treasures first wins the game. But it is not that simple to find a path to the treasure! 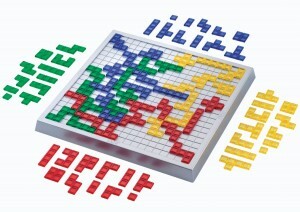 The board is a constantly changing maze made of square tiles depicting parts of paths. Some of the tiles can’t move, while others are movable. At each turn players have to slide an extra tile back to the board changing the maze for their own benefit or to stop opponents from reaching their treasure. We have the Junior version which is very similar except that there are tokens instead of cards and the board is 5 x 5 instead of 7 x 7 tiles. We play it by drawing a token from the pile and then all of us try to get the treasure shown on the token. Because the board is less complex kids 5 and up can play Labyrinth Junior. 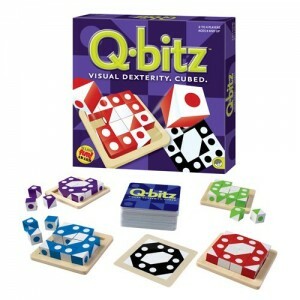 Q-bitz is another great game by MindWare. 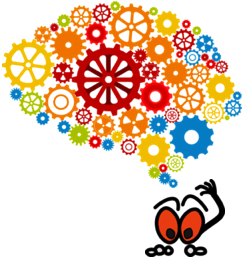 It teaches spacial thinking in a very fun way. It can be played solo or against others. The goal is to arrange 16 cubes to match a pattern on a Q-bitz card. The cards are flipped one after another and up to 4 players race to copy the patterns. The first to complete a pattern wins the round and takes the card. The player with the most cards at the end is the final winner. Kids 6 and older can enjoy this game. More advanced players may add challenges such as rolling the cubes for a desired side or trying to make the match from memory. This set includes 80 Q-bitz cards, 4 wooden trays, and 4 sets of 16 cubes. Other Q-bitz versions are also available. Blokus is a strategy game for 2-4 players ages 5 and up. It is as simple or as complex as the players make it to be. Adults also find it interesting to the point of having tournaments in Europe. The game consists of 400-square board with 84 pieces in 4 colors and in varying shapes. At the beginning of the game each player has 21 pieces in blue, red, green, or yellow. The players take turns to put their pieces on the board according to the rules. When placing a piece it may not lie adjacent to the player’s other pieces, but must be placed touching at least one corner of their pieces already on the board. The player who gets rid of all of their tiles first is the winner. Blokus versions include Travel Blokus, Blokus To Go, Blokus Duo for two players, Blokus Trigon featuring hexagonal board, and Blokus Junior. Rush Hour is a single player thinking game. It includes 6 x 6 grid board, 40 set-up cards, 16 cars and trucks in varying colors including 1 special red car. First, the player chooses a card and sets up the vehicles according to the scheme on it. Then the fun begins. The trucks and cars have to be moved to new positions to reveal a path to the exit for the red car. The first few cards are easy to solve but the difficulty level increases with the card number. The game is appropriate for kids 8 and older. There is no upper age limit to it because it is challenging even for adults. Additional challenge cards can be purchased separately. 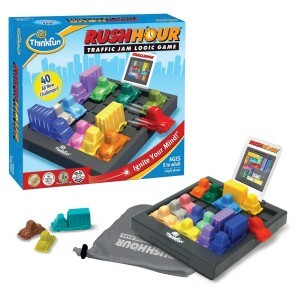 ThinkFun Rush Hour Jr. has less challenging cards and is for younger players. This game is the single player counterpart of Khet 2.0. Like all ThinkFun games it comes with 60 challenge cards, from beginner to expert. Once the pieces are set according to the card the goal is to add a few more pieces so when the laser shoots, the beams hit the targets. Sometimes the pieces have to be turned to achieve the goal. There are 11 pieces total: 1 Laser, 5 Target/Mirrors, 2 Beam Splitters, 1 Double-Mirror, 1 Checkpoint, and 1 Cell Blocker. The game effortlessly teaches about light reflection. The mirrors reflect the laser at 90 degree angle. The beam splitters work like mirrors and transparent glass at the same time, i.e. some of the light is reflected at 90 degrees, while the rest is allowed to pass though in a straight line. 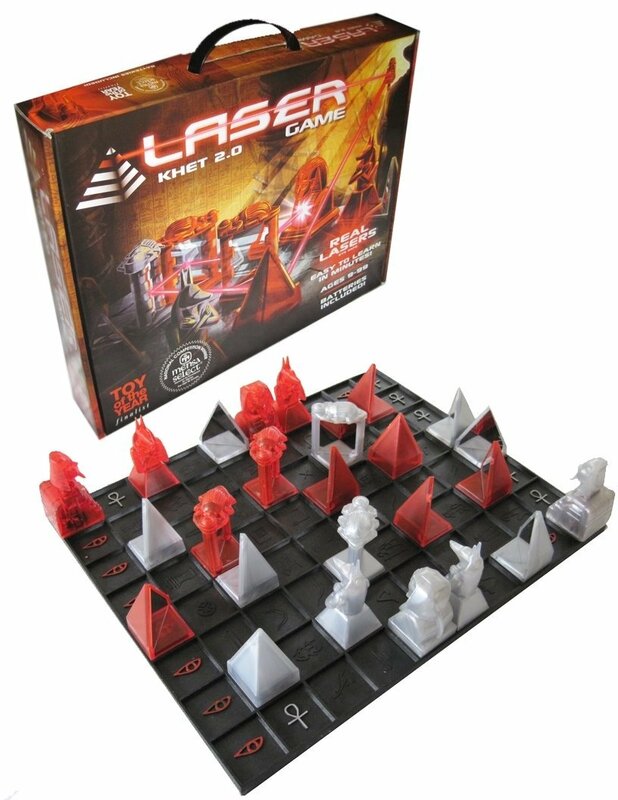 The game is suitable for children 8 and older and is a perfect warm-up to the Laser Game: Khet 2.0. SmartGames make many wonderful single player puzzle games for children. Camelot Jr. with its 3-D wooden blocks is particularly engaging to younger kids. Children are challenged to make a castle with a path from the knight to the princess using just a few blocks. The blocks to be used are determined by each of the 48 challenges in the booklet. The beginner challenges can be solved by 4 year olds while the expert ones are a challenge even for 8-9 year olds. The game includes a wooden base, 4 towers, 3 stairs, 1 bridge, a princess and a knight. 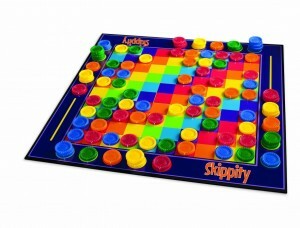 Skippity is more colorful version of checkers. It is also easier to play than checkers and kids as young as five enjoy it. The game is for 2 to 4 players. First the players randomly lay out one hundred tokens in five colors on the colorful 10 x 10 game board. The four central squares are left empty. Then on a turn, each player takes a single token and jumps orthogonally over an adjacent token to an empty space, capturing the token jumped. Multiple jumps are possible, with the player capturing each token jumped. The ENI puzzle is a wonderful brain teaser. It is easier to solve than Rubik’s cube and is for kids 5 and older. Although solution instructions are included one can actually do things with it even without instructions. It is fun to manipulate and create designs with the colorful tiles. There are 8 columns of 5 tiles each and the whole cylinder is 3″H x 2.25″W. 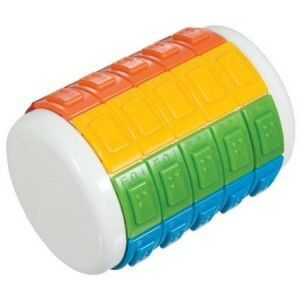 The travel version ENI Mini Puzzle is smaller but has 8 tiles in each column. There is one empty space for moving the tiles. You can slide tiles up and down utilizing the empty space. You can also turn the rings on the cylinder to move the empty space in another column. This ENI puzzle is also suitable for the blind with its Braille markings on each tile. ENI puzzle is modeled after this Vintage Hungarian Tower of Babel puzzle which some people find easier to manipulate. It is the same concept but different implementation. Good selection in my opinion. The laser game is for thinkers.